The Lao government is working with development partners to draw up a strategy to mobilize assistance to help develop the social sector amid current aid cuts, the government told to the National Assembly (NA). Lao President Bounnhang Vorachit on December 10 issued a decree on promoting the military rank of Defence Minister Chansamone Chanyalath from Senior Lieutenant General to General. The government of the Lao PDR, under the leadership of the Ministry of Planning and Investment, and UNICEF met today, Dec 11, to assess progress towards improving children’s lives in the country. Chinese Minister of Foreign Affairs Wang Yi and his delegation will pay an official visit to Laos on Dec 16 in response to the invitation of his Lao counterpart Saleumxay Kommasith, according to the Ministry of Foreign Affairs of the Lao PDR. The Singaporean Ministry of Foreign Affairs funded a 4-day training course on “Strategies of Case Management: Challenges, Solutions and Innovation” for 15 Lao government officials from Dec 4 to 7, 2018. Representatives from Laos and Japan yesterday discussed several key issues to improve the investment environment in the country. Experts from Laos and partner countries in the region have gathered in Vientiane for the 50th Meeting of the Asean Consultative Committee on Standards and Quality (ACCSQ) and its Related Meetings from December 10-14. Prime Minister Nguyen Xuan Phuc received visiting Lao Minister of Justice Xaysy Santivong in Hanoi on December 10. The Lao Cattle Quality Project organized a real demonstration demonstration on raising cattle to small farms in the end of the month. 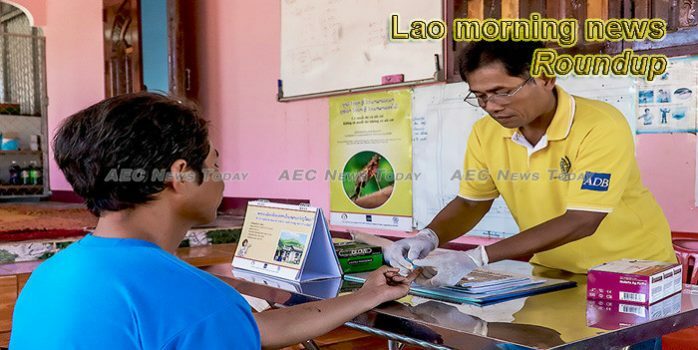 This week’s Lao morning news feature photo acknowledges International Universal Health Coverage Day, December 12.